Bone health is not likely the first thing that comes to a patient’s mind following a cancer diagnosis. But, for advanced practitioners, nurses and nurse navigators, the prevention of bone complications becomes a priority for their patients. Last night, physicians, nurses and advocates filled the room during the inaugural Bone Health Champions gala to honor four oncology nurses who have committed themselves to educating patients, raising awareness and making advancements regarding bone health. Those who are most at risk to suffer from bone complications or bone metastases are people who receive a diagnosis of breast, prostate and lung cancers, as well as the blood cancer multiple myeloma. Isobel Lewis, RN, OCN, a nurse practitioner at Memorial Sloan Kettering Cancer Center in New York City; Patrick Spencer, BSN, RN, OCN, a nursing clinical specialty coordinator at The Mount Sinai Medical Center in New York City; Cynthia Campbell-Baird, RN, OCN, CCRC, a research nurse coordinator at Penn State Milton S. Hershey Medical Center in Hershey, Pennsylvania; and Patricia Fredenburgh, BSN, RN, ONN-CG, a nurse navigator at Levine Cancer Institute in Charlotte, North Carolina, all understand that this is key in helping patients win their fight. Their nomination essays were written by colleagues, some of whom joined them on stage to read them aloud to the crowd of 150 people. 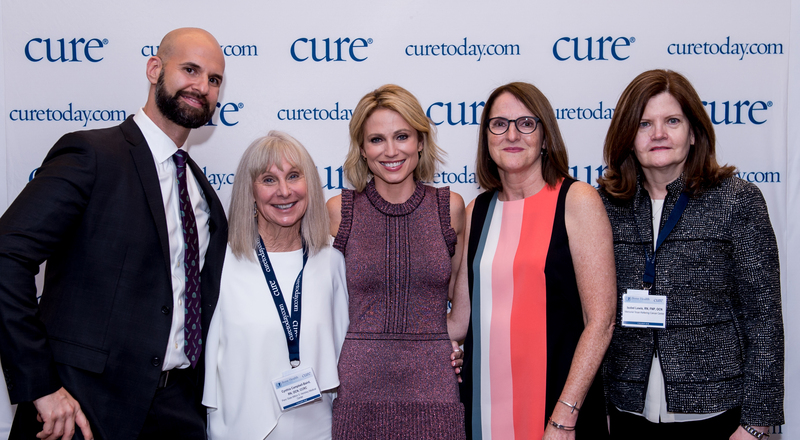 The recipients were then one-by-one presented with an award delivered by CURE co-founder and the evening’s mistress of ceremonies Kathy LaTour and ABC’s Good Morning America and soon-to-be 20/20 news anchor and breast cancer survivor Amy Robach, who served as keynote speaker. “Nothing prepared me for what happened on October 30, 2013. That is the day that doctors told me I had breast cancer,” Robach told the audience, who intently listened as she shared her story. Robach had only learned of her disease after having a mammogram on live television in Times Square with millions of people watching — something the then 40-year-old was initially reluctant to do because she had no history of the disease in her family and felt she was too young to possibly be affected. She credits this move for saving her life. The married mother of two girls and three stepsons described how she “completely fell apart” and “was in hysterics” as she sat alone while her doctor read her biopsy report. But in the room, a nurse was rubbing her back and offering words of comfort. Again, it was nurses by her side as she began treatment. Robach recalled fond memories of her oncology nurse, Beth, who threw her a bubble party on her eighth round of chemotherapy. Robach, who underwent a double mastectomy despite her surgeon’s disapproval, received a diagnosis of stage 2 invasive disease. The second malignant tumor, this one in her left breast, was only discovered following her mastectomy. Today, she remains on tamoxifen, a drug that has an estrogen-like effect on the bones and can improve bone density in postmenopausal women. Lifestyle became Robach’s biggest change. She now lives, and truly lives, each day. The now 45-year-old celebrates every birthday in a big way and uses up all of her vacation days. She also follows a ketogenic diet, eliminating all carbohydrates and sugar, and exercises six days a week to maintain her own bone health. “None of us have control over what happens to us, but we all have control over how we react to life,” said Robach. LaTour commanded the stage next ­­­­discussing her mother’s journey with breast cancer that metastasized to her lungs. She suffered a tremendous amount of pain before ultimately dying from the disease. “When I read the essays about you, I thought about how different my mother’s experience would have been if she had someone to discuss her pain with. She didn’t. So, thank you from the daughter of a mother who could have definitely used your wonderful skills,” LaTour tearfully said. She then called upon Lewis and her nominator Aly Fox to join her on stage for the first award. In her essay, Fox described Lewis as dedicated and someone who is always on the frontline trying to advance care for bone health. Lewis’ nearly 40-year career has involved being proactive in the care her patients receive, including physical therapy following surgery and teaching new nurses about treating patients with bone complications. In just two years at Mount Sinai, Spencer has become an integral part of the multiple myeloma practice embodying empathy, warmth and humor, said his colleague and nominator Ajai Chari, M.D., associate professor of Medicine, Hematology and Medical Oncology. Although a registered nurse for 15 years, Spencer has focused on oncology the past seven. He takes the time to discuss vitamin D intake, dental health and bone density scans with his patients — all important components of preventing bone complications. As a certified clinical research coordinator, Campbell-Baird has helped move bone research from phase 1 clinical trials to marketed bone drugs. Additionally, she raises awareness in her community educating inmates at local prisons, being part of prostate and breast cancer support groups and participating in think tank groups. With more than 30 years of oncology nursing experience, Fredenburgh has spent the past seven years working specifically with patients who have received a diagnosis of multiple myeloma. The nurse navigator works with patients to help them from pre‐diagnosis through all phases of cancer. She educates those in the clinic, the inpatient unit and local support group leaders. Like many of the patients that these four nurses champion for each day, Robach had her team behind her.